Take a deep breath of that salty sea air and hear the distinctive songs of the seagulls - the ocean is a treat for all of the senses, which is why travelers tend to head to coastal locales during vacations. And where better to experience the ocean than a place called Ocean City? On the eastern Maryland coastline, you'll find relaxation, fun, and some of the finest resorts and hotels in the state. Choose your favorites from our selection of the best! Shangri La Motel, much like its namesake, is paradise on earth! 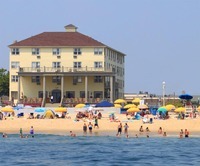 Known popularly as one of the best values at the beach, family-owned and operated Shangri La Motel prides itself on providing clean, comfortable, and spacious accommodations to Ocean City visitors year after year. Besides the stupendous charm and hospitality afforded to every guest, Shangri La also features numerous amenities fit for royalty. Whether you're cannon-balling into the pool or relaxing beach side, Shangri La is the place for you! Join an exciting Ghost Walk during your stay in Ocean City and discover all the historic spots in town! Starting at the Life-Saving Station Museum and including local spots such as the Trimper’s menagerie carousel and the Shoreham Hotel, this Ghost Walk is a great way to explore and learn all about the town--all while keeping your eyes peeled for signs of paranormal activity! Shangri La Motel is located in north Ocean City on the ocean-side of Coastal Highway at 84th street, which means you're only a half-block walk to the beach! This excellent location also ensures you're within walking distance to plenty of restaurants and shops as well! Located just a half block from the beach and near many of Ocean City's finest restaurants and shops, Sea Hawk Resort is ideal for travelers looking for an affordable getaway! Sea Hawk Motel has been family-owned and operated since its inception, so you know you'll receive the utmost of personal service and hospitality throughout your stay. Inside each room you'll discover clean, comfortable accommodations and plenty of amenities to keep you cozy. Check out the onsite pool or head out and hit the beach for a relaxing afternoon of sandcastle building, seashell searching, and swimming. Come see why guests come back year after year after year! You don't have to spend all your time at the beach during your Maryland coast getaway. When you stay at Sea Hawk Motel, you're minutes away from 17 championship courses in the area! Spend an afternoon enjoying the beautiful ocean views as you aim for that hole-in-one! Sea Hawk Resort's accommodations feature modern amenities such as cable television with free HBO and Disney, mini-fridge, balcony, telephone and private bath. Located along Maryland's beautiful Eastern Shore, Osprey Point is everything you're looking for in a luxurious northern Chesapeake Bay getaway. Osprey Point is a charming Maryland coast inn that features elegant accommodations across three separate buildings. Each location offers its own unique style but all are impeccably furnished and equipped with modern amenities. Indulge in a cozy room complete with a flat-screen television, private bathroom, wireless internet, plush bathrobes, and more. Enjoy a delicious breakfast in the morning as part of your stay as well! Discover the gentle waters of Chesapeake Bay by lounging along the local shores to enjoy the views or plan a day of kayaking, paddle-boarding, or boating. You can also check out nearby sights and sounds such as the Eastern Neck National Wildlife Refuge, the Rock Hall Museum, and live entertainment at The Mainstay. No matter how you choose to spend your time, a vacation at Osprey Point offers you everything you're looking for in a memorable Maryland vacation! Osprey Point Marina will enhance your boating experience, both on board and ashore, with its attentive staff, floating docks and immaculate, modern bath house. Featuring American Cuisine, their on-site restaurant Osprey Point Restaurant has a reputation for being the best in Kent County. Cayman Suites Hotel, known for their friendly service and spacious hotel suites, is another fantastic place to stay in Ocean City. The service, accommodations, and amenities are absolutely unbelievable for what you'll be paying. While each room provides every amenity one can reasonably expect from a modern hotel, perhaps its best feature is that all one has to do is change into your swimsuit in your room, step out the door, and you’re practically on the beach! Families are more than welcome, as Cayman Suites prides themselves on its smoke-free, family environment! Bring the kids, the spouse, and the self for an unforgettable weekend in Ocean City! As of 2013, Ocean City had a population of 7,092. During the summer, Ocean City becomes the second most populated town in Maryland! When Central Reservations claims to offer the best resort vacation rental properties in Ocean City, it's not just empty words. They have the homes, locations, and hospitality to back it up! If you're looking to stay somewhere that gives you the ability to stretch your legs out, why not stay in a luxurious vacation rental? And when choosing a vacation rental, there's simply no better selection than Central Reservations'. All of their condos, townhouses, and homes are divinely located so as to offer easy access to the ten miles of white beaches the city is famous for. Take a stroll on the boardwalk, get out on the water for some sports fishing, or have a blast at a nearby waterpark and amusement park- with Central Reservations, Ocean City will feel like heaven! Make sure you check out the adjacent Jolly Roger Park, comprised of SpeedWorld, Splash Mountain, Jolly Roger at 30th Street, and Jolly Roger at the Pier. Fun for the whole family! Known far and wide for its sprawling front porch overlooking both the boardwalk and the beach, The Plim Plaza Hotel is perfect for the beach-seeker in all of us! As you've probably gathered from the earlier entries on this list, Ocean City is filled to the brim with incredible places to stay. And yet the Plim Plaza still manages to differentiate itself, through its hospitality and charming beach aesthetic. When you stay at the Plim Plaza, you're always just steps from the powdery sand beach and the cold surf of the Atlantic Ocean. Feel free to walk down the shoreline and find the perfect spot for a tanning session, an invigorating swim, or a deep sea fishing expedition. Or stay on land and explore the sensational shopping and delicious dining along the boardwalk! You're just a stone's throw from all the boardwalks attractions. Outstanding restaurants, specialty shops, and downtown amusements are just outside your door! You won't have any problem satisfying your stomach with onsite options Caribbean Pool Bar & Grill, Paul Revere Smorgasbord, and the Mug & Mallet Restaurant! Another extravagant hotel at a paradoxically low, low price, you're always only seconds away from the excitement of the boardwalk and the relaxation of the beach at the Flagship Oceanfront Hotel. Walk all the way down the boardwalk and you'll find the Flagship, better known as the perfect place to explore Jolly Ranch and Splash Mountain (the local theme parks)! It's also primly located to all the bars nightlife, shops, and dining along the strip. Walk out the door, hop on the tram and head downtown to enjoy all your favorite sites. And, just a short walk north, you’ll find a quiet and tranquil spot to enjoy the sand and the surf. So what are you waiting for?! Your stay at Flagship includes free access to an exercise room and tanning bed, one parking spot, and free wireless internet! Flagship Oceanfront hotel has both guestrooms and efficiency units overlooking the courtyard, outdoor pool, beach, and boardwalk. Breathtaking views, spacious rooms, and unprecedented service, all at a bargain price! 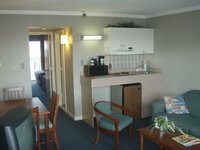 Holiday Inn Suites is perfect for the getaway seeker on a budget. The Holiday Inn's central location makes it ideal for striking out from and enjoying the sights and sounds of Ocean City. But if you choose to hang back at the Inn, you'll have your pick of a plethora of things to do and see. Take a dip in the Inn’s two oceanfront pools. The zero entry Activity Pool is a favorite for any age with its lazy river and adjacent Jacuzzi. Back in your room, relax and soak in the two-person Jacuzzi tub or under the down pour of the rainfall shower, and unwind in the ocean breeze from your private bedroom balcony. During your stay at Holiday Inn Suites, enjoy a number of area golf courses, Charter Boat Fishing, and Jolly Roger or Trimpers Amusement Parks! Kids eat for free at Holiday Inn Suites! Holiday Inn Oceanfront, located in the aptly-named Ocean City, offers a full menu of modern amenities and services to enhance your stay at the finest family friendly tropical beach resort this side of the Mason-Dixon line. Go for a dive in either the sparkling indoor or outdoor pool, where you and your family are free to splash and play in the outdoor pool or swing in the beachside hammocks and listen to the ocean waves. Fun games and seasonal/activities for kids (and adults) of all ages in our colorful gameroom. Inn Oceanfront has everything you need for a relaxing vacation or getaway, do bring your mom, your brother, or your great uncle three times removed- Regardless who you arrive with, you'll leave with a ton of happy memories. A 16-minute drive from Ocean City Municipal Airport, this beachfront resort is also a 13.8-mile drive from Assateague Island. The facility also offers an on-site Italian restaurant, room service, a fitness center, indoor and outdoor pools with a seasonal bar/grill, and free parking. As the self-proclaimed most luxurious family-friendly hotel in Ocean City, Hilton Suites Ocean City Oceanfront is the perfect place for vacationers seeking peace and quiet with a side of fun. And really, who isn't seeking that? Guests arriving at the only Four Diamond rated hotel in Ocean City find a laid-back yet sophisticated design and décor carrying them to a new level of revitalization. Not only are you just steps away from the beach, but your stay in one of the hotel's contemporary suites features all the perks you expect from the Hilton name and uninterrupted ocean views from just about everywhere. Of course, the opulence doesn't stop there. From custom artwork and furnishings to deep-soaking Jacuzzi tubs and two oceanfront pools, you'll truly feel like Maryland royalty at the Hilton Suites Ocean City Oceanfront! The hotel is a 5-minute walk from Ocean City's 3-mile boardwalk with its shops, arcades and street performances, and a 6-minute walk from Jolly Roger Amusement Park. Amenities include a game room, a walk-in kids' pool with waterslides and a lazy river, and an adults' pool with a swim-up bar. Smack dab on the famous Ocean City boardwalk, Harrison Hall Hotel offers its guests intimate surroundings, a quaint, accommodating staff, and unforgettable memories. From the hotel's old-fashioned, spacious front porch, you can enjoy views of the boardwalks plethora of attractions and activities, including amusement parks, arcades, shops, marinas, restaurants, and so much more. Take a short walk and relax on the beach, or grab a rocking chair on the porch and take a well-deserved nap- it's your vacation, after all! There's an Olympic-size outdoor pool with a bar, a wading pool and complimentary coffee and tea 24 hours a day. The hotel is 2.5 miles away from Tanger Outlets and 1.7 miles away from the Ocean City Convention Center. 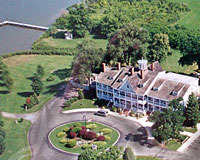 Classic couples, family, and group vacations begin at this historic inn on Maryland's Eastern Shore. Historic Kent Manor Inn lets you experience Maryland's rich history and natural beauty, from original marble fireplaces in its rooms to flora and fauna at nearby nature centers. Go antiquing in Old Town Stevensville! Hop in a kayak and explore the Chesapeake Bay, just a few paddles away. Savor creative cuisine in the onsite restaurant. Relax on a veranda overlooking the 220 woodland acres that surround the inn. World-class golf, shopping, and watersports are all close by on your memorable Maryland vacation! Step back in time when you stay at this historic Maryland manor. The original wing, circa 1820, has been fully restored and updated with modern comforts. Delight in original features like Italian marble fireplaces and a rooftop cupola at the Historic Kent Manor Inn! Enjoy an adventurous outing at this beach which features views of the Bay Bridge, picnic area, trails, and much more, all steps away from your lavish accommodations. If you're looking for unprecedented splendor, look no further than Clarion Resort Fontainebleau and its high end directly on Maryland’s beautiful Atlantic coastline! Fontainebleau's attention to detail shines through in almost every aspect of their hotel, from the amenities to the accommodations to the overall environment of the resort. Choose from any of the resort's 250 rooms, available in all shapes and sizes. There's king sized rooms, two floor cabanas and double rooms, each decorated and furnished to have you feeling right at home. As for things to do, let's just say you won't be bored should you elect to hand around the hotel. From swimming in their pools to getting a full work out in the state-of-the-art fitness center, there is plenty for guests to do without leaving the resort! 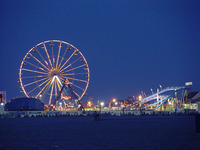 Ocean City attracts a staggering eight million visitors to the city each year. Clarion Resort Fontainebleau features over 40,000 square feet of combined meeting space and cutting edge technology to accompany the meeting spaces. Their expert planning staff can help you with logistics and help you plan a meeting that will leave an impression on your guests. There's few better ways to enjoy beautiful Ocean City than a spacious Vacasa Vacation Rental! Whether you're a family looking to make some memories or a couple just in need of a weekend away, a Vacasa Rental is just what the doctor ordered! Of course, the accommodations are just part of the draw, as Ocean City's numerous attractions and activities should be experienced to their fullest extent. You could spend a millennia enjoying numerous shops, beaches, and boardwalks Ocean City is famous for! Meanwhile, the surrounding waters are perfect for kayaking, boating, and cannonballing into on a hot summer's day! The town supports a year-round population of about 8,000. Ocean City also has a public transportation system referred to as the "Beach Bus" which runs along pretty much the entire length of the city, 24 hours a day, 7 days a week. Prior to 1870, what is now Ocean City was known as "The Ladies' Resort to the Ocean." For those that are nautically-inclined, there's no Maryland hotel better than the Hyatt Regency Chesapeake Bay! There are all types of water within walking distance of your cozy accommodations. From the marina, to the pool to the Choptank River itself, anybody who loves getting wet will be in nirvana. Away from the water, you'll find the multitude of other activities in the Cambridge area. Play 18 holes at River Marsh Golf Club, recharge at the Sago Spa and Salon, or make a splash in the temperature controlled indoor or outdoor pools. The Hyatt's spacious accommodations each offer private balconies and incomparable views! The resort is 2.8 miles from Richardson Maritime Museum and 4.3 miles from Bill Burton Fishing Pier State Park. Additional amenities include a marina, a golf pro shop and a kids' club, plus a market, 6 restaurants, event space and a business center.